Almighty God, who hast enriched thy Church with the learning and holiness of thy servant Bede: Grant us to find in Scripture and disciplined prayer the image of thy Son our Savior Jesus Christ, and to fashion our lives according to his likeness, to the glory of thy great Name and the benefit of thy holy Church; through the same Jesus Christ our Lord. Amen. Almighty God, who has enriched your Church with the learning and holiness of your servant Bede: Grant us to find in Scripture and disciplined prayer the image of your Son our Savior Jesus Christ, and to fashion our lives according to his likeness, to the glory of your great Name and the benefit of your holy Church; through the same Jesus Christ our Lord. Amen. 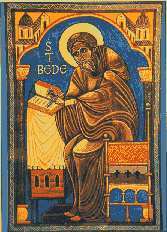 Bede was a monk at the English monastery of Wearmouth and Jarrow, in Northumbria. From the age of seven, he spent all his life at that monastery except for a few brief visits to nearby sites. He says of himself: "I have devoted my energies to a study of the Scriptures, observing monastic discipline, and singing the daily services in church; study, teaching, and writing have always been my delight." He was the first person to write scholarly works in the English language, although unfortunately only fragments of his English writings have survived. 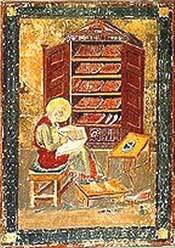 He translated the Gospel of John into Old English, completing the work on the very day of his death. He also wrote extensively in Latin. He wrote commentaries on the Pentateuch and other portions of Holy Scripture. His best-known work is his History of the English Church and People, a classic which has frequently been translated and is available in Penguin Paperbacks. It gives a history of Britain up to 729, speaking of the Celtic peoples who were converted to Christianity during the first three centuries of the Christian era, and the invasion of the Anglo-Saxon pagans in the fifth and sixth centuries, and their subsequent conversion by Celtic missionaries from the north and west, and Roman missionaries from the south and east. His work is our chief source for the history of the British Isles during this period. Fortunately, Bede was careful to sort fact from hearsay, and to tell us the sources of his information. He also wrote hymns and other verse, the first martyrology with historical notes, letters and homilies, works on grammar, on chronology and astronomy -- he was aware that the earth is a sphere, and he is the first historian to date events ANNO DOMINI, and the earliest known writer to state that the solar year is not exactly 365 and a quarter days long, so that the Julian calendar (one leap year every four years) requires some adjusting if the months are not to get out of step with the seasons. His hymns include one for the Ascension, which follows. Now rises to the throne of God. "This is his glorious triumph day.